황매산의 남쪽 기슭에 있는 절터이다. 처음 지어진 연대는 정확히 모르나, 고려 현종 5년(1014)에 적연선사가 이 곳에서 83세에 입적했다는 기록이 있어, 그 이전에 세워진 것으로 추정된다. 또한 국립중앙박물관에 있는 홍각선사비의 조각 중에도 ‘영암사’라는 절의 이름이 보이는데, 홍각선사비가 886년에 세워졌다는 점에서 영암사의 연대를 짐작할 수 있다. 발굴을 통해 조사해본 결과, 불상을 모셨던 금당·서금당·회랑터·기타 건물터가 확인되어 당시 절의 규모를 알 수 있고, 금당은 3차례에 걸쳐 다시 지어진 것으로 밝혀졌다. 절터에는 통일신라시대에 만든 쌍사자석등(보물 제353호)·삼층석탑·귀부·당시의 건물 받침돌·각종 기와조각 들이 남아있다. 특히 금동여래입상은 8세기경의 것으로, 절의 창건연대를 살피는데 중요하다. 영암사의 건물터는 일반 사찰 건물과 다른 몇 가지 특징이 있다. 금당이 있는 상단 축대의 중앙 돌출부 좌우에 계단이 있는 점, 금당지 연석에 얼굴모양이 조각되었고 후면을 제외한 3면에 동물상을 돋을새김한 점, 서남쪽 건물터의 기단 좌우에 계단이 있는 점이 특이하다. 이러한 특징과 더불어 절터 내에 흩어져있는 석조물은 이색적인 느낌마저 준다. 조형의 특이함과 입지 조건, 서남쪽 건물의 구획안에서 많은 재가 나오는 점으로 보아 신라 말에 성행한 밀교의 수법으로 세워진 절로 보인다. 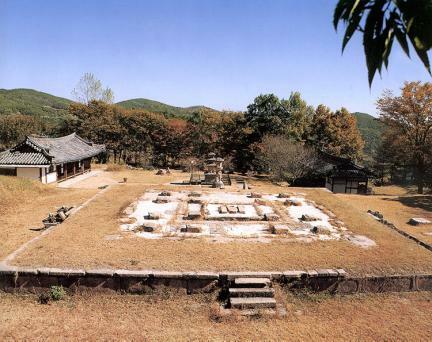 Yeongamsa Temple Site was located at the southern foot of Hwangmaesan Mountain. 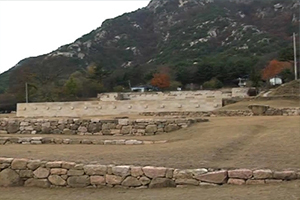 The time of construction was not certain, but it was likely built before the 83-year-old Master Jeogyeon, a renowned Zen monk, entered Nirvana here during the Goryeo Dynasty (1014). The year of foundation could be estimated from the record of Stele for Master Honggak in the National Museum of Korea, since Yeongamsa Temple as recorded on the Stele for Master Honggak was built in 886. 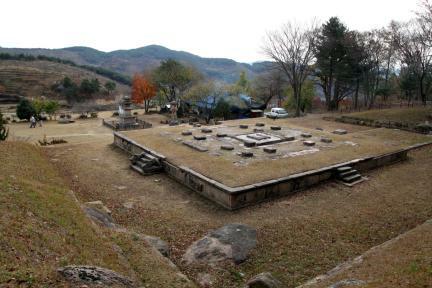 The size of the temple was estimated from the site of Geumdang Hall, which preserved bodhisattva, Seogeumdang Hall, and other building sites. 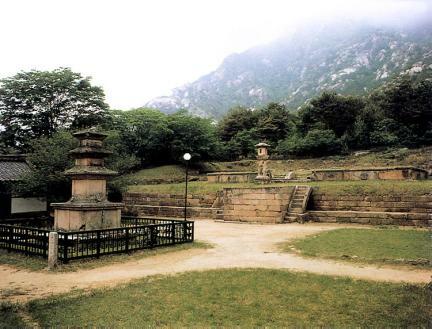 Among them, Geumdang is known to have been restored three times. At the temple site, the Twin-lion Stone Lantern (Treasure No. 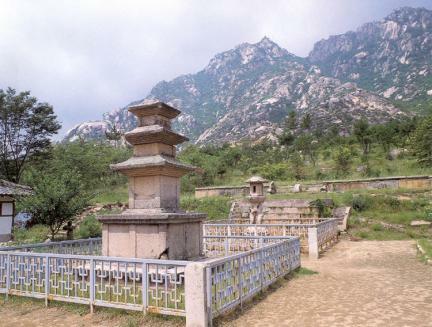 353) built during the Unified Silla Period, Three-story Stone Pagoda, Tortoise-shaped Pedestal, and tiles remain. In particular, the Gilt-bronze Standing Buddha built in the 8th century was an important clue for the year of construction. 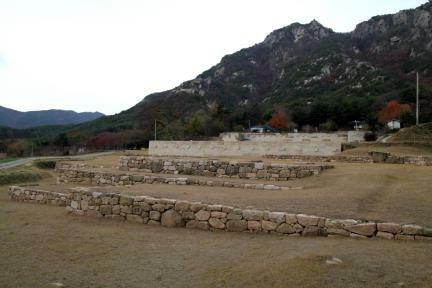 Unlike common temple buildings, the building site in Yeongamsa Temple had several features: stairs on each side of the middle projecting part of the embankment in Geumdang; face-shaped pattern engraved on the curbs in the site of Geumdang; animal statues engraved on the three sides except the back side, and; stairs on both sides of the pedestal at the southwest building site. Along with these features, stone architecture lying scattered at the temple site looked unique. 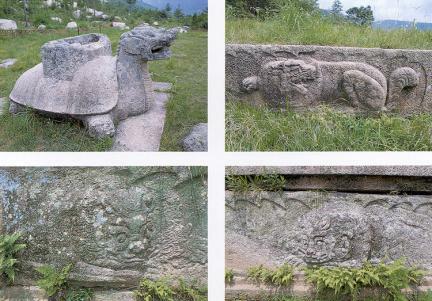 The temple likely followed the typical style of esoteric Buddhism in the late Silla period, judging from the peculiar style of molding, geographical condition, and ashes around the southwest building site.